Julius Ceaser said, “Veni. Vedi. Vici.” I came. I saw. I conquered. Although Julius Ceaser took the credit for a conquest of the majority of the ancient world, none of it would have been possible without the Roman Army. Roman army was probably the largest, most efficient and most successful of all the armies of the ancient world, conquering most of the known world. It was the first paid full-time professional army in the world. The Roman Legion was the standing force of the empire numbering from one hundred and fifty thousand (150,000) to two hundred and forty thousand (240,000) men who were stationed in the various provinces. With superior tactics and organization, weapons designed specifically for war such as the Gladius, the Legion was an unstoppable force for nearly a millennium. A full strength legion was officially made up of 6,000 men, but typically all legions were organized at under strength and generally consisted of approximately 5,300 fighting men including officers. Contubernium: (tent group) consisted of 8 soldiers (legionaries). 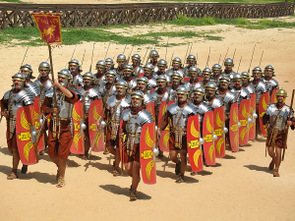 Cohorts: (cohort) included 6 Centuriae or a total of 480 fighting men, not including officers. In addition, the first cohort was a double strength but with only 5 Centuriae instead of the normal 6. Legio: (Legion) consisted of 10 cohorts. Additionally, each Legion had a 120 man cavalry unit called the Eques Legionis permanently attached to it possibly to be used as scouts and messengers. The helmet with colored crest and face protectors, breastplates or chain mail; greaves; the parma (a round shield); the scutum, an oblong wrap-around of hiding on a wood frame, edged with metal, with the insignia of the legion painted on; the pilum (a spear); the hasta Velitaris, a light javelin of about 3 feet with a 9-inch metal head and a short sword they borrowed from Spanish tribes, the Gladius, it was both pointed for thrusting and edged for slashing. Roman formations were open. 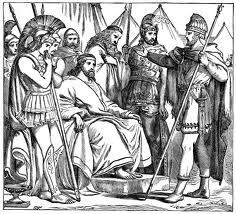 The last thing they wanted was to be crushed together and cut down without being able to use their weapons, as they had been so many times before, and as so many armies who never studied Roman warfare were to be later. Disciplined and well-trained Legionaries fought in closed ranks, for the glory of the empire, against many warrior based armies, where each man fought for personal glory.